Steindorff cordless microscopes eliminate the need for electrical outlets and allow your microscopes to become portable. They are supplied with long life 10,000 hour bulbs. The cool LED illumination allows for extended stay of live specimens. The rechargeable Nickel Metal Hydride (NiMH) batteries are mercury free and environmentally friendly and have a life of up to 500 recharges. Full recharge takes 8 hours giving approximately 50 - 70 hours of continuous use per charge. 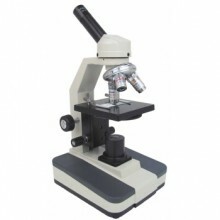 Choose from a variety of models that include a re-charger, which allows use of the microscope while re-charging. Regular batteries can also be used in the event that re-chargeable ones are not available. A specially designed condenser and optical lens system allows for brighter, sharper images. Each microscope comes complete with dust cover, instructions, rechargeable batteries and single station charger. All microscopes come with a five-year manufactures warranty plus a one-year free extended warranty for a total of six years. Click the button below to add the Steindorff® S3085C Monocular Cordless LED Microscope to your wish list.